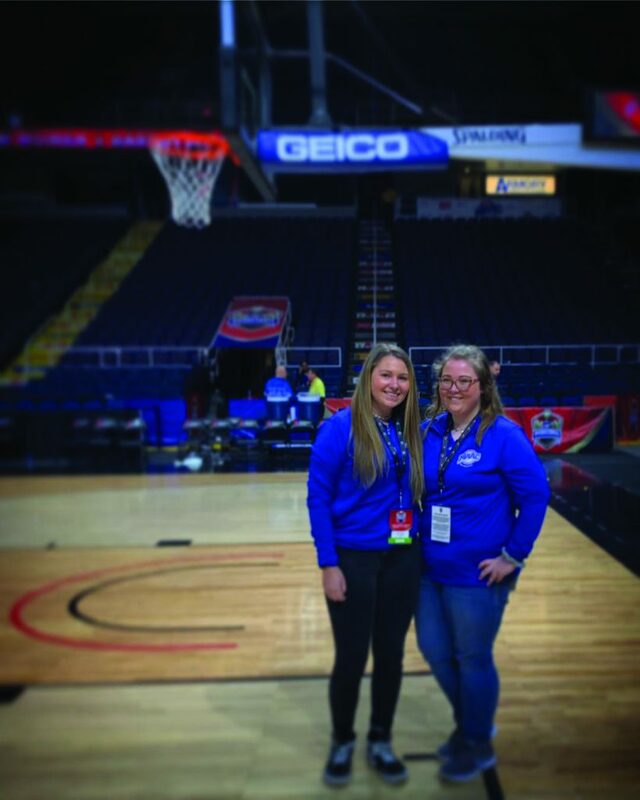 Freshmen Sarah Waldron (right) and Kaylee Ettinger (left), who worked z the 2018-19 academic year for BroncVision had the opporunity to work alongside professionals and other students at the MAAC Basketball Tournament. Students affiliated with BroncVision, the streaming service for Rider athletics, had the opportunity to attend the MAAC basketball tournament in Albany, New York from March 7 to 11. Freshmen film, TV and radio majors Kaylee Ettinger and Sarah Waldron, senior sports management major Matt Gonzalez and sophomore sports media major Austin Boland-Ferguson worked a variety of jobs for the post-season games. Waldron and Ettinger agreed that their knowledge of broadcast has vastly expanded because of their experience at BroncVision. It’s gotten to the point where they don’t watch a game the same way a fan would. The two went to a restaurant on their day off and saw a game on TV. Ettinger, who coordinated the graphics for the productions, was going through the motions as if she were putting the graphics up herself and anticipated which graphic would come next. For Gonzalez, going to Albany was a “no-brainer.” In addition to being the “Dunkin’ Cup” in the MAAC mascot basketball game, he loved seeing how other schools ran the show. The students didn’t just work with Rider’s games in the tournament, nor were they with their colleagues the entire time. Waldron worked with a handful of students from Iona University. Chris Foster, assistant athletic director for digital and new media, said that the collaboration with other students working the broadcasts was immensely beneficial. The MAAC’s 11 affiliated schools are contractually obligated with ESPN to produce live broadcasts on ESPN3 and ESPN+. Following Rider’s first year operating its production truck, Manhattan College has secured its own truck and will start making content in the 2019-20 academic year. Students can watch Rider athletics’ games for free on ESPN3 or create an ESPN+ membership for $4.99 per month. Published in the 3/27/19 edition.